“The new 1%” gained $260Bn since March 1, the 99% lost $260Bn. Over the past 10 weeks – so since March 1, 2017 – five stocks in the S&P 500 index have gained a total of $260 billion in market value, the infamous FAANG stocks: Facebook, Apple, Amazon, Netflix, and Google (now Alphabet). By any measure, $260 billion is a massive surge in valuation for just five stocks, or 1% of the S&P 500, in just 10 weeks. And the rest of the S&P 500? On March 1, the index closed at 2,394. Today it closed at 2,397. In those 10 weeks, it went absolutely nowhere. Which means this: the remaining 495 stocks in the index lost as much in total market capitalization as the FAANG stocks gained. Facebook has been edging lower from its high of May 2 and today closed at $150.48, which still gives it a market capitalization of $436 billion. Apple, which closed at a high of $153.99 today, hit a market cap of $802 billion, after the Warren Buffett surge. Via a quarterly SEC filing, his investment vehicle disclosed that its holdings of Apple shares had jumped to $19.2 billion as of March 31, from $7.1 billion on December 31. It now owns 133.65 million shares. The filing was immediately mediatized. Buffett’s avuncular face appeared on CNBC yesterday. Everyone talked about it. And after already rising due to this enormous buying pressure, Apple shares surged some more. He has a powerful megaphone. He can even move the shares of a giant like Apple and benefit handsomely from his megaphone. If Apple moves 10%, $80 billion move along with it, up or down. Amazon rose to a high of $952.82 today. Everyone is itching to short this stock. A lot of people followed their itch to short it at $100 a share, and then at $200 a share, and so on, getting their heads handed to them all along the way in this crazy market. The stock now sports a market value of $455 billion and a PE ratio of about 180. Netflix is the dwarf in this bunch with a market cap of $68 billion. But it gained 10% in those 10 weeks. Its PE ratio is 203. But unlike Tesla, moving closer with its market cap of $52 billion, Netflix at least has a positive PE ratio. Alphabet – the old G in FAANG – has surged 11.6% over the past 10 weeks to $932.17 a share, giving it a market cap of $651 billion. The five FAANG stocks combined have a market value of $2.4 trillion. That’s the size of the GDP of France. And just forget the rest of Corporate America and its struggles. On the other hand, a decline of 30% – not unheard of with these stocks – wipes out $720 billion. But we’ve been reassured: that’ll never ever happen again. The price of these reminds me about share prices right before the stock market crash in 1929. Huge prices – how can any ordinary person even think about buying a 100 share lot of one of these companies? Brokerages now allow buying less than 100 shares, with no “odd-lot” penalty. Same commission. I buy 50, 60, 40 shares all the time. Not these guys, but smaller equities. There is no competition any more. That’s the problem. The big companies simply buy everything that threatens them. The government looks the other way. Of course the govt looks the other way. The govt created these behemoths. Welcome to fascism. Exactly a point I have been coming to in analyzing the modern, tech-heavy economy. There are several new monopolies, and that, coupled with a weak government (all branches, but the executive could show leadership by pursuing anti-trust), have made for a few firms dominating the whole economy. Several decades ago, this would not have happened. Sensible regulation (minimal), is essential to free markets (going back to the father of the idea, Adam Smith). Libertarian/anarcho-capitalism is the religion that has polluted the elite of the “right”. Realistic libertarians understand the need for sensible, ethical regulation. It is a form of fascism, but a new kind. What you say is so true. Remember when Janet Reno used to come gunning for Microsoft. I miss those days. Blandness and conformity are in now. People don’t want to stand out or have to make choices. Cars are all silver, black, or white. Phones all look the same. Clothes are either tasteful and neutral or slobwear, take your pick. New buildings are all unoriginal variations on glass boxes, designed by computers. Interiors are white, minimalist variations on hotel rooms. Anything too colorful or different is perceived as clutter or weird. Is it any surprise that monopolies are taking over? Great observation SSK, makes me think of Dave Matthews Band “Ants” …Lights down, you up and die. Ah, so you do understand: the government threatened them. So they bought it. All too easy. TPTB acquire wealth and power the way other hoarders acquire trash, with pathological motives, and they do not recognize limitations or boundaries. For some problems there really are no solutions, and this looks like one of them. After a while, it’s partly on you not to support these behemoths anymore. But nah, in Murica, it’s always the government’s fault. When will Muricans learn that there’s a price to everything? All too true in this ” Culture of Complaint ” America we live in where everyone is desperate for a ‘ scapegoat ‘ to blame all their ills on .. both circumstantial and volitional .. turning to demigods , con artists , snake oil salesmen and political extremism for solutions that inevitably turn out to be worse than the problems they promise to solve. As a prime example .. look how many times comments whine about the economy and loss of jobs while extolling the virtues of shopping online and dining at the chains . Need to think about this for a while, but it does not feel good. Its almost like a mini NASDAQ Holding up the entire S&P. That can not be a good thing. Dot Com Busts and all that. 260 lost and 260 gained is a Spread/Movement, of .52 T $. When you can start expressing things in . T $ its a lot. Thats a lot, inside and index, that went basically nowhere. 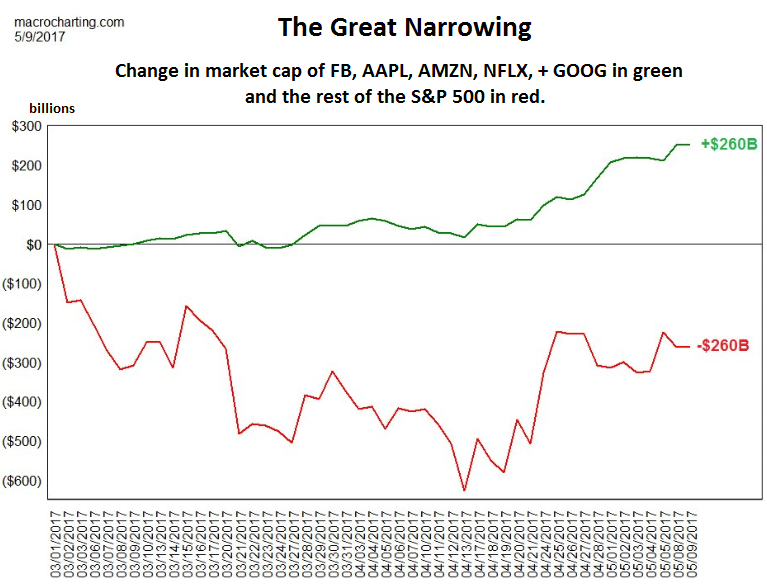 Think closer to our time frame: it’s the same thing that happened in 2014 and the FAANG is still composed of exactly the same stocks. And you can well understand why the Fed is getting nervous about asset prices: this wasn’t supposed to happen. Price inflation was supposed to benefit the whole S&P500, not just a handful of companies. But investors, especially us NIRP refugees from Europe and our Japanese friends, tend to flock to where safety and stability is, or is perceived to be. Once this meant US Treasuries, now this means the FAANG. The riskiest position is to work yourself to a position of no risk. The iShares Transportation ETF (IYT) is lower today than where it was on Thanksgiving 2014. I remember when the well regarded Stock Market watcher, Richard Russell, used to write about how meaningful gains and losses in momentum in the Dow Transport index (^DJT) acted as a strong indicator of the future direction of the broader market. Even if one adds MSFT to the FAANG group – which would push total Market Capitalisation of the group to $3 trillion ( France and Belgium’s GDP) – total employees of all 6 firms is less than 1 million. On the other hand, Walmart has 2.3 million employees but it is not growing. Wonder why MSFT is not on that list instead of NFLX. It has to do with growth. MSFT has shrinking revenues. IBM has shrinking revenues. etc. Technicals point to an early stage bull that could last a year or more. But it’s quite possible to see minor corrections along the way. Feels more like 1998. Don’t remember if it was Mr Wolf or someone else who showed exactly the same pattern that happened leading up to dot com crash i.e., few big ones were holding up Nasdaq while small ones were taken to the woodshed. – It’s going to end in tears for the FAANG stocks. And I can’t see why Buffett is buying Apple. – Is this “cashflow” related ? Also apple is also a bond trader toady if you look at it, they own a lot of them, no junk, and not just US treasuries. And they own them OFFSHORE. Here’s the thing: for Apple’s overseas capital to be “returned” to shareholders, it needs to sell those corporate bonds and Treasuries. All companies that want to “repatriate” their cash and “distribute” it shareholders, need to sell their investments. There’s going to be a lot of selling going on. Why sell them Before Maturity???????????? Do what the fed is doing, and what they have done before, with a twist. Borrow a huge amount offshore. Repatriate it under friendly tax holiday. Allow “Offshore” bonds to mature, and pay back foreign borrowing with the maturing cash. With Warren in the Mix Things like that are even more likely. There are still Tanker loads of Money out there, on offer to entities like apple. CHEAP. The Apple Yen bonds (Issued around the same time as the US Borrowing to repatriate some cash to US shareholders) were gone in second’s. Apple could sell . 5 T + bond’s, In $ or Eur, In Europe, at a very good (for them) Rate, in Hours. As discussed, many times before, the “Cash Repatriation “, is really only a book keeping entry for tax purposes, any way. Only those entities with offshore cash that are not deemed a “Good Risk” may be forced to sell bonds to repatriate and distribute. Apple makes a lot more sense for Buffett than IBM ever did. Apple sells products to consumers at significantly higher prices than it’s competitors despite similar (if not lower) costs. It’s a long-term competitive advantage if you believe customers will continue to pay the premium. In addition, the company has been highly profitable for years and is trading at a relatively cheep multiplier. They pay a divided and have bought back a lot of shares in recent years. The only thing that Buffett wouldn’t like is its reliance upon technology. But is that any different from a company like RCA in the 1940s? Buffet is likely to start selling Apple soon. Well so far everyone is keeping politics out of it, except one person who referred to a ‘weak executive’. Under the circumstances, Trump firing the Director of the FBI, separating economics from politics is like separating mind from body. Along with the other risks in this ‘market’ there is now political risk, something usually associated with countries with weak rule of law. As far as the stock market is concerned we are very likely to see the flip side of the Trump Bump. Anyone who thinks the main concern of this executive in the coming months is going to be tax policy ( how would Apple be doing if it paid taxes?) or health care or anything else is fooling themselves. PS: for someone who is a circus…, sorry, a political junkie, last night’s TV was a treat. MSNBC and CNN covered the story for over an hour WITHOUT ADS. Interesting but the stock market seems to be ignoring the Trump tantrum for now. Probably far less than 180. Wonder how much of the price of each of the five is due to share buybacks (if any). Sell at the top, buy at the bottom. It’s the timing…..
What creeps me out more than anything when it comes to the FAANG’s is that the only one actually ‘ producing ‘ anything .. is Apple . Amen. Seems ridiculous that Facebook is now worth almost a half TRILLION dollars and what is it?… basically an advertising firm. Unbelievable. I think Facebook is like an addiction; Facebook junkies spend their entire day on Facebook; they gain nothing from being on Facebook, but they are there. Of course, you have to ask yourself how much money a junkie has to spent on what is advertised on Facebook. I have never been on Facebook, but a couple of month ago, I created 2 accounts to see if I can gain anything from being on Facebook. The answer is zero, zip, zilch, nada. I truly gained nothing except clicking on like on some woman’s Photoshopped photos. Fed put is rock solid. The clowns buying protection are simply proving they’re not “in the know.” Instead of politics we are provided puppet shows like the Comey comedy. The percentages in this article are of those owning stock. It’s worth remembering, IMO, that the economy also comprises folks who don’t participate in that gambling. They march to a different drummer and their measure of relative standing is entirely different. At this point Apple is iPhone, and the iPhone has been making incremental improvements at best since about the 5 or 5s. I resisted getting an iPhone for years and at the point that I finally caved and got the iPhone 4, it was because it was clear it was the most functional and high quality phone on the market at that time. That phone seemed indestructible. Today, it’s no longer so clear the iPhone is superior to the better Android phones and every year, I can think of quite a few people who have made the switch. Every iPhone I’ve had since the 5 has had major problems, and Apple has been less than helpful. Sit at the “Genius Bar” for 5 min and count the number of irate, dissatisfied customers. Let’s remember the ads for iPod that came out months before product launch. Apple is all about marketing and hype, the hype machine for iPhone 8 is already cranked up to the max. Because if iPhone 8 doesn’t perform, Apple will be in trouble. Also doesn’t bode well that iPhones are not doing well in China, their only meaningful growth market. I was just in China and was amazed at how few iPhones I saw, only the wealthy can afford them. Also amazing / terrifying is the real estate bubble in the big cities, but that’s another topic! iPHones would become commodity like any other .. It not if but when. I have both iphone and android and I find them more or less equally good..
iPods, MacBooks, iPhones, etc., were never necessarily superior to their rivals. They’re just nice looking designs with software in a walled garden, so things just “work,” and that hasn’t changed. Amazon has the most room for growth in the group. Anybody with money is already buying from them and as the middle class grows around the world, they too will buy from them. They mostly excel at selling commodity type goods, but they do it well. Netflix will grow as the cord cutting grows. Cable is getting too expensive and hasn’t provided good value for years now. We downgraded our cable and replaced the movie channel with Netflix. I get a lot more for my money with it. Google is the most vulnerable in the group because their entire income is derived from search. At some point they will lose that advantage and then FB, Apple, and the rest will eat their lunch. I think alphabet is generating income from cloud services. Google gets its revenues from ads, not directly from searches. The search was an excuse to get us to see the ads. A few years ago, Mark Cuban predicted the demise of Google because mobile phones don’t have as much space as desktops for showing ads when one is searching. Yet, the company is bigger than ever before — it is now one of the hubs for self-serve ads. Also, notice that Google made no headway in social space and in spite of the ‘wash-your-linen-in-public’ attitudes and the corresponding montezations of everything “social”, Google is still bigger than FB. The point is that the system is dynamic and so are the responses of the players. The fact that Google has been around for more than 20 years and has survived the various fads so far means that it can adapt to the game. Also, there is this ongoing concern about Google becoming a one stop shop for all information (they scrape away all the information from various websites and show you nice summaries when you ask a question). So unless people stop searching for information altogether, I suspect Google will be around. Also, hasn’t Alphabet bet on finding gold on mars, a la Bezos? Google has already failed at social media against FB. I don’t do FB but I understand they are competitive in social, mobile, and advertising with Google. If FB were to improve their search engine, they could easily overtake google in targeted advertising. FB has more individualized data they can mine, they claim to have 1.9B users. The likelihood is that over time FB will get better at search than Google will get at social media. Indexing (all the rage) just adds fuel here. New money gets put into the market in proportion to existing market values….those stocks go higher….new money gets put into the market in proportion to existing market values…those stocks go higher….. So this illustrates the fallacy of a President pointing to the stock market as proof of an economic recovery, whether that be Trump or Obama. (It used to bug the heck out of me when Obama would pull that stunt). A stock market may or may not be a good indicator of the broader economy. 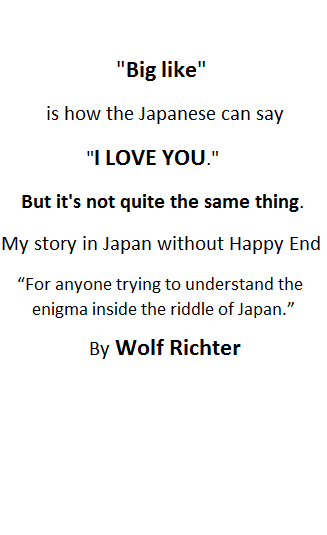 Nice article, Wolf. Succinct, and for bubble watchers, pertinent and timely. I am amazed at the quantity of high quality content on this site, not only the articles but the intelligent and courteous comments!! Remember, as stock price rises for these behemoths, the harder it is for them to grow the stock price. It takes more revenue dollars to maintain the same price level. This is why stock valuations ultimately crash under their own weight. If there is any kind of earnings recession, the effect is magnified. Things can change fast. i think this article exemplifies an important point : Just because an index is rising in value doesn’t mean that all of its components are also appreciating . This info tells me that there has been a lot of buying in FAANG stocks not via an ETF purchase. Allow “Offshore” held bonds to mature, and buy/pay back foreign issued Bond’s/Borrowing’s with the maturing held bond’s cash. This is a small step, but please use Firefox rather than Google Chrome. Browser is everyone’s gateway to the Internet. Right now, I see that Google won’t allow many kinds of plugins for their Chrome. If they get to have monopoly on Browsers, you know very well what they will do. Firefox is far greater than Chrome in anyway; but with our support, it can thrive even more. The divergence in the stockmarket as a whole has been very evident for some time now.